As the year comes to close, Ahram Online's Books staff present a list of the 10 best books published in 2015, based partly on recommendations provided by well known book critics. This year half of our list was recommended by prestigious critic and professor of Arabic Literature at Cairo University Gaber Asfour, the writer of Times of the Novel and In Defense of the Enlightenment, and Sayed Mahmoud, editor-in-chief of Al-Kahera cultural newspaper issued from Cairo. 1. Ahlam Fatret Al-Naqaha ... Al-Ahlam Al-kheera (The Dreams of Convalescence ... The Last Dreams), Naguib Mahfouz (posthumous, Cairo: Dar El-Shorouk), 2015. The recently discovered manuscripts of the only Arab Nobel laureate, Naguib Mahfouz, who passed away in 2006, have been published posthumously after his two daughters found handwritten papers in his home office. The manuscripts apparently were part of the dreams that he wrote after his recovery from the assassination attempt on his life in 1994. The dreams were released for the first time in 2005 by his publisher, Dar El-Shorouk. This collection of dreams is part of it. 2. Fi Kawales Asharq Al-Awsat (Behind the Middle East's Scenes: Memoires of a Le Monde Journalist) Éric Rouleau, Trans: Dalia Seoudy (Cairo: Al-Tanany Publishing House), 2015. 375pp. The memoires of the late renowned Egyptian French journalist Éric Rouleau, who died in February 2015, were published in Arabic this year with a preface by Alain Gresh and Lakhdar Brahimi. Éric Rouleau, one of the most famous journalists who worked in the Middle East, reported for Le Monde and AFP, among many other news outlets. He knew the Middle East like no other foreign journalist and met with almost every decision maker in the region during the past 50 years. The book is a must read. 3. Nosous Hawl Al-Quar'an (Texts around the Quran: In pursuit of the Living Quran), Ali Mabrouk (Beirut: Al-Markaz Al-Thankafy Al-Arabi), 2015. 320pp. Ali Mabrouk, a philosophy professor, is yet again challenging the established religious discourse built around the Quran, the central text in Islam. In this book, Mabrouk suggests that a historical shift has happened in the understanding of the Quran in Islamic culture. He argues that the Quran has been turned from a discourse to the people and to believers into a transcendental discourse that we cannot be in dialogue with, or discuss. In his words, this move "has turned the Quran from a space to reflect and think to a holy icon that we just look at and seek praises from.” The book tracks this historical shifting process and suggests a new horizon where we can be in dialogue with the holy text again. 4. Arriwaya Al-Mafkouda (The Missing Account), Farouk Al Sharaa (Doha: ACRPS), 2015. A Syrian insider’s account of the failed peace talks with Israel as well as a valuable memoir by a man who was at the forefront of Syrian decision making for decades. This indeed is the “missing account” while American figures like Dennis Ross and Madeleine Albright, and Israeli politicians and military officers, including Uri Sagai and Itamar Rabinovich, have told their countries’ version of events. This is the first time that such a senior Syrian figure, a former vice president, has broken the silence on the subject. Al-Sharaa offers valuable information about the personal relationships between former President Hafez Al-Assad and his brother Rifaat, the same president’s dealings with Saddam Hussein of Iraq, and the stormy relationship with Palestinian leader Yasser Arafat as well as the story of Syria’s intervention in the Lebanese civil war. 5. Fi Tarqi El-Aza (In Harm's Way: From the Strongholds of Al-Qaeda to ISIS Incubators), Yosri Fouda (Cairo: Dar El-Shorouk), 2015. 233pp. Thirteen years after his meeting with the masterminds of 9/11, Ramzi Bin Al-Shibh and Khalid Sheikh Mohammed, Yosri Fouda, the renowned investigative reporter and former Al-Jazeera reporter, tells the story of how he became the first and only journalist to meet the two key lieutenants of Osama Bin Laden who plotted the 9/11 attack, and of the making of the documentary that made his fame, exposing the information that Bin Al-Shibah and Khaled Sheikh Mohamed gave him while he listened to them for 48 hours. He also adds a chapter about his journey through the Syrian border to Iraq with smugglers, and how he got close to Donald Rumsfeld without even knowing it. The book is very well written and narrated. Critical thinking gives us the tools to think about the world and create our visions of it, yet critical thinking itself in its philosophical forms was a subject of criticism. The author of this book tackles critical thinking in its Western sources, represented by the texts of great philosophers like Immanuel Kant, G W F Hegel, and Karl Marx, who founded the concepts of philosophical critique. The author also examines contemporary forms of critique in the works of philosophers like Jacques Derrida and Michel Foucault. From this point he studies critical currents in contemporary Arab thought. The book won the award of best Arabic Book in 2015 granted by the Arab Thought Foundation. 7. Kateeba Sawda (A Black Battalion), Mohamed El-Mansy Qandil (Dar El-Shorouk), 2015. 473pp. A novel about war, warlords, and slaves, and also kings, religious men and revolutionaries. The title of the novel, "Black Battalion", refers to the small groups of slave soldiers who were taken from Egypt to fight alongside the French army. El-Mansi Qandil draws a historical and geographical picture of the era from 1863 to 1867 when Napoleon agreed with the Ottomans in Egypt to move hundreds of slaves to fight in Mexico, where they find themselves torn in a war they have no part in. 8. Hekayat Al-Hosn w Al-Hozn (“Tales of Beauty and Sadness”), Ahmed Shawqy Ali (Beirut: Dar Al-Adab), 2015. The first novel by the young Egyptian writer Ahmed Shawqiis built upon on the Mutazil principle of divine justice. The novel focuses on the life of its protagonist, Gharib, who is transformed into a ghost against his will. He decides to use his new superpowers to create his dream love. He does not create her directly, but rather through weaving a new life that he imagines in his own mind. 9. Lam Ya'od le Oroba Ma Toqademoh lel Arab (Europe Has Nothing More to Give to Arabs), Khaled Ziada (Cairo: Dar El-Shorouk), 2015. Historian and Lebanese Ambassador to Cairo Khaled Ziada tackles the relation between the Arab world and Europe as a culture, arguing that most Arab cultural production is an expression of the "problematic" relation between Arabs and Europe. Ziada tries to reread Islamic-European relations in order to get to a better understanding of the historical progress of contemporary Arab thought on current problems. 10. Gymnasium, Mai Khaled (Cairo: Dar Al-Araby), 2015. Mai Khaled's Gymnasium is not only a place for physical training and workouts: it is a place for mental peace and psychological training. 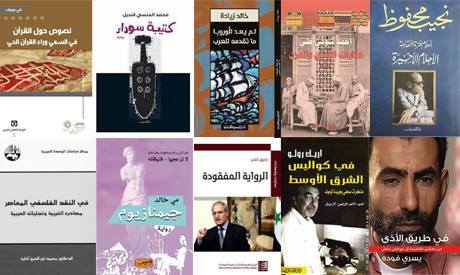 Mai Khaled's third novel deserves to be on this list, according to Sayed Mahmoud.